** The listed swim distance is the maximum distance. We reserve the right to shorten the distance for any swimmer to ensure each wave starts on time. Guided tours of the race course will be available on the Friday evening before the event, starting in the lobby of the Memorial Centre at the reception desk. The tours will start at 5:30 and 6:30pm. Life jackets will be provided for any swimmers that want one. Flutter boards and swim noodles are not permitted. Swim caps are optional and will be available on the pool deck. To ensure a safe swim, we limit the number of swimmers in the pool at one time. Swimmers start in a wave format. Be sure your child knows how many lengths in the pool they are required to complete prior to starting the race. Volunteers will assist with length counting in the pool. Athletes aged 3 – 5 years old ride on a course behind the Woolwich Memorial Centre. 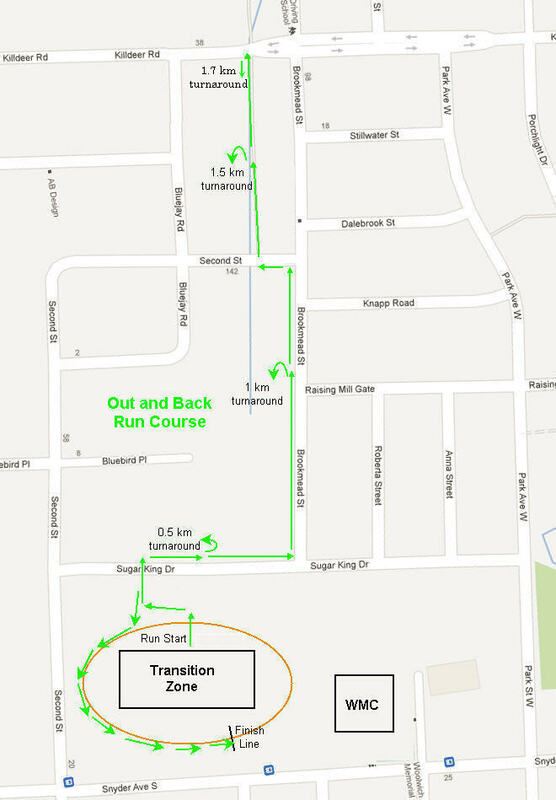 Athletes aged 6 and older ride a 1.25 km course loop on quiet streets surrounding the Centre. Older kids will complete multiple loops of this course. Roads are open to traffic but supervised by police and volunteers. Be sure your child knows how many loops of the bike course they are required to complete prior to starting the race. The older age groups will be completing several loops of the bike course. We use a designated single-file lane where volunteers keep track of the loops completed by each rider. The athletes will slow as they enter this section of the bike course. Once the required number of loops have been completed, a volunteer will direct the athlete into the Transition Zone to prepare for the run. We provide stickers with the race number for the front of the helmet, which helps with loop counting. Athletes aged 6 and older run on an out-and-back course on roads and a paved path. All run courses end under the finish line on the track to the cheering of family, friends and spectators. There will be two water stations on the run course. The Transition Zone is an enclosed area where the kids move from the swim to the bike course and from the bike course to the run course. Volunteers will be available in the Transition Zone to help kids before and during the race. The transition zone is behind the Woolwich Memorial Centre. The Transition Zone is in the centre of the running track. For athletes 6 – 9 years old, the Transition Zone will be closed to all parents at 9:00 a.m.
For athletes 10 and older, the Transition Zone will be closed for all parents at 11 a.m.
After completing the swim, the athlete will walk or run to their Transition Zone where they will put on a shirt and shorts (optional) for the ride. Bike helmets must be fastened and worn at all times while the athlete is in contact with the bike, even when dismounted. After finishing the bike course, the athletes will be instructed to dismount their bike prior to crossing the Bike Dismount Line. Athletes walk or run their bike back to the Transition Zone and rack it in the same location. The athlete cannot remove their helmet until their bike has been racked. With the bike course completed, the athlete prepares for the run and exits the Transition Zone under the Run Exit sign which leads to the final leg of their race. Get to the race at least 1 hour prior to the start of your wave so that you can set up your race gear. Each athlete must take their bike to the Transition Zone where they will place it on a marked rack with their helmet and other bike and run gear. Look for the age group signs to see where your bike and other gear should be racked. Bring two towels. Put one towel on the ground beside your bike to hold your race items (shoes, socks, etc.). The other towel can be used for drying off after the swim. You may also want to leave a water bottle with your gear so you can take a drink before and/or after the bike ride. Athletes should pin the race number on their shirt prior to the start of the race.